So given that we at Wood Planet Gaming Lodge have touched upon this so-called “Dystopian” universe before, it felt only right to come back to visit the aftermath of the world introduced last time around. After all, we just can’t get enough backstabbing around these parts, and lying through our teeth is quickly becoming a game day past-time! But first… let’s get the book-keeping part of this review out of the way. 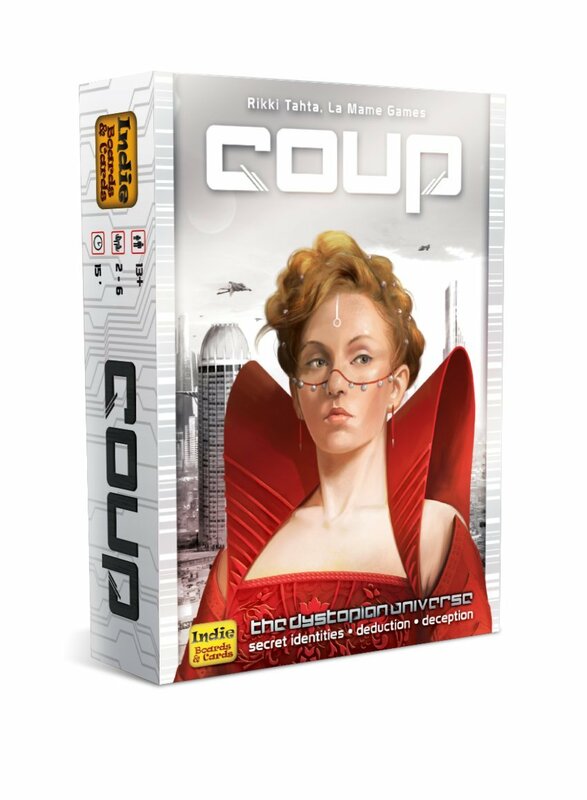 Coup is a multiplayer card-game where each player is a power-grabbing royal in a cut-throat world of lies and betrayal run by multi-national corporations (a real stretch of the imagination these days, I know…). Every player commands a “court” of two powerful political figures, both of whom offers a unique set of abilities ranging from thievery, bribery, even so far as assassinations. However, these courts are all kept in secret. Players have no idea which nobles their opponents have under their thumb. Meaning, players can… and will… lie and cheat their way to riches and power. But is it any good? Or is this little power trip a fantasy best left in the Budget Bucket of Corporate Doom? It might be telling of my board-gaming group that we seem to prefer games with a healthy element of treachery. For the longest time, Battlestar Galactica filled that need. The game even started to leak into other aspects of our gaming. A couple rounds of Murder on the PC can quickly start accusations of so-and-so being a Cylon. Because let’s be honest – it’s always much more fun to be the Cylon. The same mentality extends – in aces – to the board-game The Resistance. I say board-game loosely. If I were being truthful, the game is really more of a simulation of how to quickly lose friends. It combines all of the backstabbing needs of Galactica down to a thirty-minute game-time and has already replaced the aforementioned title as our board-game-of-choice when we feel the need to plant a dagger into a friendly back.